For those of you who are new to The Life of JWo, I write “Travel Logs” each day when we go on vacation. Since we didn’t go anywhere, I didn’t write any for 2013. This is Day 1 of our 2013 trip to Ocala, Florida and Gulf Shores, Alabama. You can read my 2009, 2010, 2011 and 2012 logs by clicking on the year. Our 2014 vacation wasn’t scheduled to start until Saturday, but we headed out a few days early so we could swing by Florida for Tammy’s grandmother’s funeral. Wednesday night we dropped off Savannah at my Mom’s house in Tupelo and got ready to hit the road early Thursday morning. Since we would be heading down to Ocala, Florida for a few days, we had to change our route a little. Google Maps suggested we go through Birmingham, Alabama, over to Atlanta and then down to Tallahassee, Florida. I decided against that route because I had no desire to go to Atlanta and, most importantly, because my Mom had been talking about a bakery they would hit on their way down to Gulf Shores. 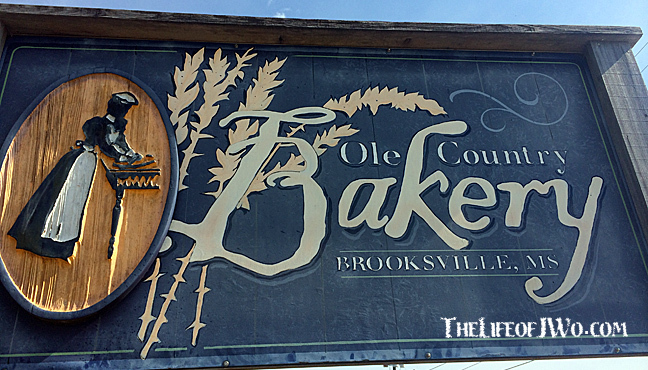 So I altered the route to include a stop at the Ole Country Bakery in Brooksville, Mississippi, before shooting over to Tuscaloosa, Alabama and then over to Montgomery, Alabama, before heading south to Florida. Before we made it to Brooksville, we passed The Pony “The Ultimate Strip Joint” in Starkville, Mississippi. Usually passing a strip joint doesn’t get much reaction from me, but this was the ULTIMATE strip joint, so I glanced over and saw their sign. That’s when I realized why they were the ULTIMATE strip joint. Me: Holy crap, did you see that? They’re gonna have midget strippers!! Me: Yeah!! How awesome is that? I bet I could totally get a crew together to come down here for that. I KNOW Billy (co-worker) would go with me. He loves the midgets. Me: I’m serious. Do you know awesome that would be? I wouldn’t be able to stop staring at them. I’ll keep you updated on whether or not we actually make it back down there. Ole Country Bakery in Brooksville, Mississippi. We rolled into Brooksville a little after 9 a.m., walked inside and I instantly saw a problem. 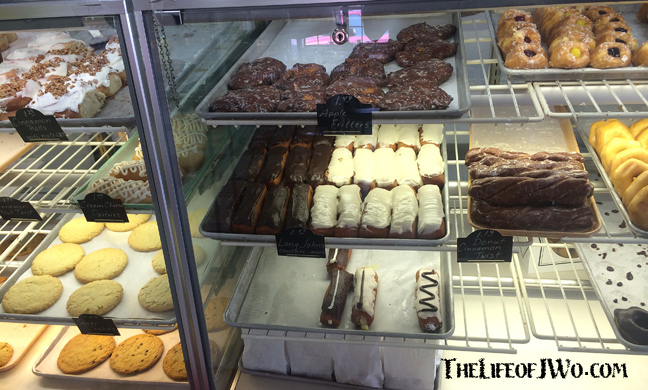 The only reason we stopped by the bakery was because Mom had talked up their “homemade” Apple Fritters and there was only ONE in the display case. I started pushing Tammy toward the cash register so she could order, but before she got to the register another customer gave his order and the last fritter was taken. But fortunately one of the bakery workers said they had another tray in the back and seconds later it was rounding the corner. 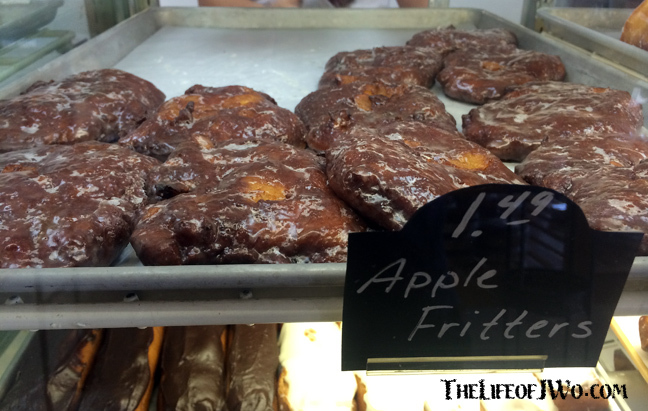 We each got a fritter, as well as a bunch of other fried, sugary goodness and got back into the car. One of my purchases was gone before we even got out of the parking lot. The fritters were good, but they weren’t reroute-my-trip-again good. They were very cinnamony, but Tammy and I both agreed that they ones at Gibson’s Donuts in Memphis were better. We pulled out of the parking lot and headed on our way. By 9:22 a.m. we were going the wrong direction. Me going the wrong direction is something that happens multiple times on a trip, but I wasn’t expecting this one to happen so quickly. Apparently we were so focused on our doughnuts that we missed our turn. Fortunately I realized we were going the wrong way about five minutes after we passed our exit, so we weren’t too far behind schedule. Since we were traveling back roads on our way to Birmingham and Montgomery, we kept going through small towns and I kept noticing two things. First, there were an awful lot of Dairy Queen signs. At one point I told Tammy that I thought it was a sign that we needed to stop and get some DQ. Every single time we saw a DQ sign, or passed one, I brought it up. Another thing we noticed that every small town we went through had one thing in common. They ALL had a Dollar General. Seriously, I don’t think we went through a town without seeing one. Granted it’s not like I’m paying attention to every Dollar General out there, so do a little research on your own. We rolled through Montgomery without any issues and pulled into a gas station in Dothan, Alabama. As I pulled in I heard Tammy talking. Tammy: Are you going inside? Me: No. But if they had a Dairy Queen I would. Tammy: What do you think I said? Me: If I was going inside. Tammy: No, I said, Are you on the wrong side? Your gas is on my side, not yours. Me: Oh… Crap, I am on the wrong side. I got Dairy Queen on my brain. We made our way down to Troy, Alabama, which is the home of Troy University. In case you didn’t know that they make sure to remind you by placing billboards all along the highway into town. We rolled into Troy and it didn’t take long for Tammy to size up the city, like within 5 minutes of entering. Tammy: This is a sucking place for a university. She changed her tune as we made our way through the town. Tammy: Maybe it’s not SO bad. At one point the song “Day Drinking” by Little Big Town came on the radio. Me: Remind me to do that when we get to the beach, OK? Me: Day drink. We can do that, right? Me: Sweet. I’m wanna day drank on the beach. Me: That’ll be awesome. Don’t let me forget. I think I like this band. They got that Motorboatin’ song and the Day Drinking song. I like both of those things. It wasn’t long after we crossed into Florida before all of those Dairy Queen signs had started to work on Tammy. Tammy: I’m thinking I could use something cold from Dairy Queen. Me: What? You aren’t kidding, right? Because that wouldn’t be funny. Tammy: No, we can stop. Me: Sweet!! I’m stopping at the next one I see. I don’t remember which city we were near when I saw a sign for Dairy Queen, but it wasn’t long after she said we could stop. I pulled in and we finally got our Dairy Queen. 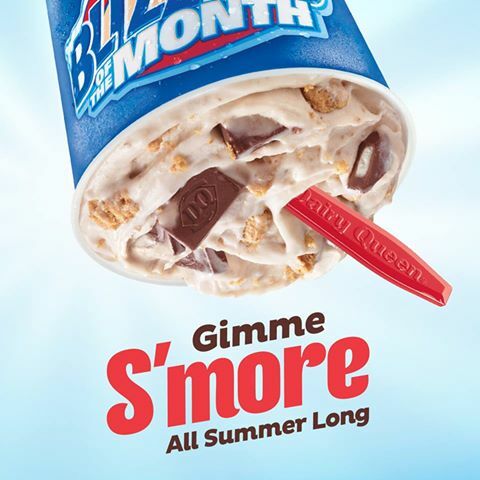 I went with the S’more Blizzard (flavor of the month) and Tammy got her usual cherry sundae. Once we hit I-75, I knew our drive was on its last legs and I was ready for it to be. I was getting delirious. Me: It was for a Quilt Shop. Do people really buy quilts anymore and do they ever need more than one in a lifetime? I think Granny still has quilts that she’s had since I was a kid. How does a place like that stay in business? Tammy: They prolly sell stuff to MAKE quilts. Me: Oh… (pause) Well that makes sense. We made it to our hotel around 6:45 p.m., unloaded the car and tried to find a place nearby to grab a bite for dinner. I was wanting a burger, but not a fast food kind, so we settled on the Chili’s in Ocala. Normally, I’m a big supported of Eating Local instead of going to chains, but I hadn’t done much research. I just wanted to get some food, head back to the hotel room to eat and go to bed. We walked into Chili’s a little around 7:15 p.m. I remember thinking that we should be able to make it back in time to watch Big Brother which started at 8 p.m. Boy, was I wrong. The bar was packed, but we eventually got seats at the bar, ordered some drinks and told the bartender we wanted to place and order to go. About 10 minutes later we finally go our order placed. We finished our drinks (I made Tammy drink quickly) in anticipation of our food arriving. Instead, we waited… and waited. Another couple sat next to us, ordered drinks and then appetizers. They finished their first drinks and got TWO appetizers delivered to them. They even finished their cheese fries before the second appetizer arrived. Someone else joined us in waiting. Apparently he had called in his order but it turned out that his food wasn’t anywhere close to being ready. He was waiting at least 30 minutes… and waiting after we left. At one point the manager came out of ask the bartender about an order. Manager: Do you still need this? Bartender: Yeah, it’s theirs (pointing to us). At this point I was getting pissed. We’d been sitting there for nearly 45 minutes and our food hadn’t even been made yet?!?!?! Another 10-15 minutes later our food came out. An hour, it took an hour to get food to-go. We paid our bill and left. We got back to our hotel room in time to watch the last 10 minutes of Big Brother. I Tweeted about how bad our experience was and Chili’s responded asking for details. Well, here are the details. Not only was the service incredibly slow for us AND the Chili’s To Go customer, but the bar was disgusting. The door for fridge where the bottle beers were was falling off it’s hinges AND being held up by two clear containers. I wish I had checked out the Urbanspoon reviews because I can see why that location only has a 67% rating. At this point we weren’t really even hungry, but we took our food and headed back to the hotel. We were in bed about an hour later and looking forward to visiting with Tammy’s family on Friday. 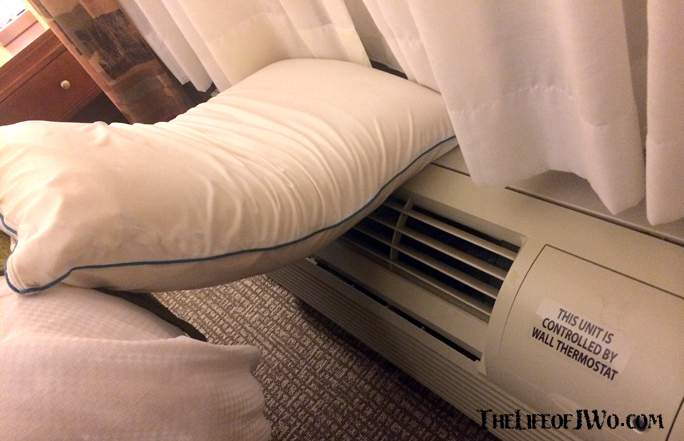 I put my pillow on the AC when we got back so it’d be nice and cold when we went to bed. Gallery | This entry was posted in 2014, Daily Life, Travel Logs and tagged daily life, Florida, humor, life, Postaweek2014, Tammy, Travel, Travel Logs, Vacation. Bookmark the permalink.